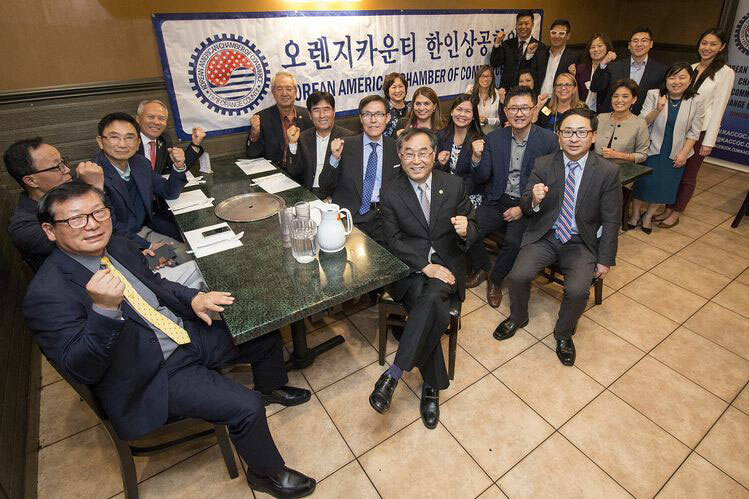 Korean American Chamber of Commerce of Orange County (President Ho-El Park) invited local politicians and Korean American leaders to host the New Year’s Kick-off ceremony. President Park said, “We will do our best to help the Korean American Business owners through various seminars and events during the monumental 40th anniversary. We will also strive to make minority voices through communication with other communities.” Participants of the event shouted together for the day, and they are determined to commence a strong new year. 한인상공회의소(회장 박호엘)가 로컬 정치인들 및 한인 단체장들을 초청해 신년 하례식을 개최했다. 지난 5일 부에나파크 아리아식당에서 열린 행사에는 섀론 쿼크-실바 주하원의원, 버지니아 본 부에나파크시장, 영 김 전 가주하원의원, 주류 정치인 보좌관들을 비롯해 OC한인회 김종대 회장, OCSD평통 김진모 회장, 상우회 전직 회장들, 상의 이사진 등 40여명이 참석했다. 박 회장은 “40주년을 맞는 기념비적인 해를 맞아 다양한 세미나와 행사를 통해 한인들에게 실질적인 도움을 주는 한편 타커뮤니티와의 소통을 통해 소수계의 목소리를 낼 수 있도록 힘쓰겠다”고 밝혔다. 이날 행사 참가자들이 함께 파이팅을 외치며 힘찬 새해 출발을 다짐했다.